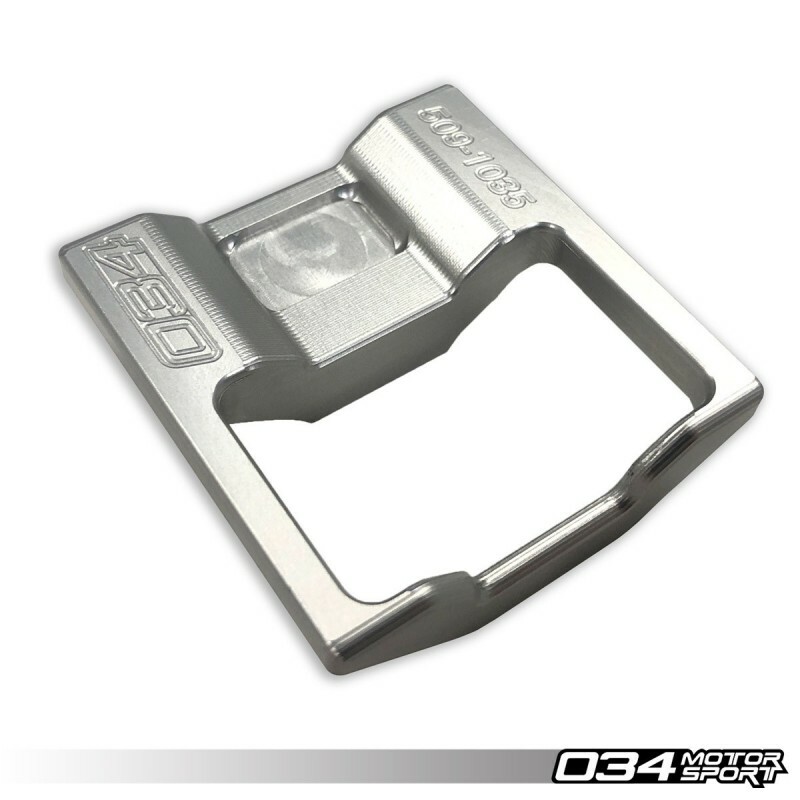 Aggressive driving that causes violent drivetrain movement, such as burn-outs that induce wheel-hop, will cause the upper and lower dogbone mounts to exert a bending moment on the dogbone mount arm, causing it to bend, and in some cases fail. When this failure occurs, the bottom of the engine is unconstrained and the engine will cause damage to other components in the engine bay. 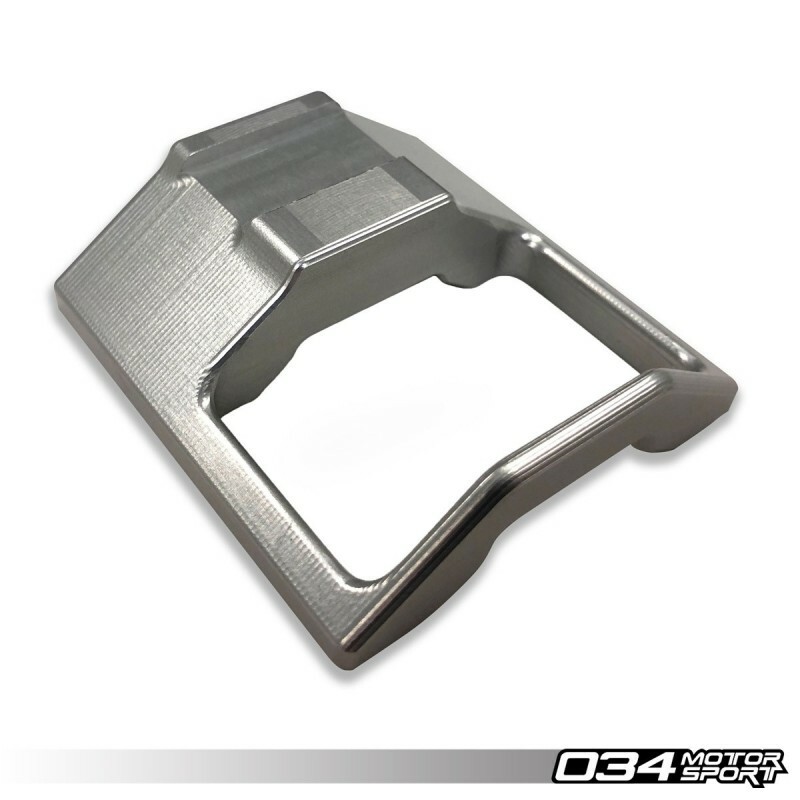 The 034Motorsport MQB Upper Dogbone Mount Insert eliminates these bending forces, allowing the dogbone mount to perform as designed during these violent events. 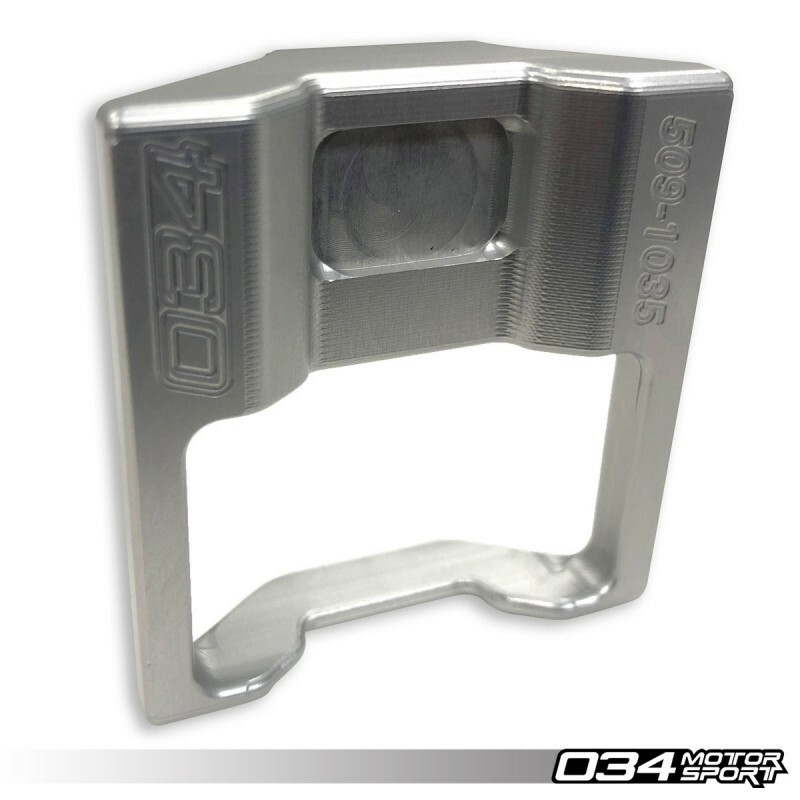 An aftermarket billet spherical dogbone mount combined with a dogbone mount insert dramatically improves the feel and responsiveness of the drivetrain during spirited driving. However, this combination of modifications, coupled with the design constraints of the MQB dogbone mount pucks, have revealed a scenario that applies forces to the dogbone mount arm that it was not designed for. The lower dogbone mount insert limits compliance of the lower dogbone mount puck by filling large voids in the puck. During normal and spirited driving, this reduction in compliance results in more direct transitional response of the drivetrain to accelerative and decelerative forces. The driver feels more direct throttle response through the drivetrain without introducing a significant amount of NVH. However, violent drivetrain shocks, such as burn-out induced wheel-hop, introduce additional forces that can cause damage to the billet spherical dogbone mount arm. In these violent events, the lower puck motion is limited by the dogbone insert, but the upper puck in unconstrained and is free to move forward. This means that the entire puck assembly rotates forward at an angle towards the front of the car. Because the dogbone mount arm is clamped into the puck assembly, the rotation of the puck assembly generates a bending moment applied to the dogbone mount arm that it was not designed for. 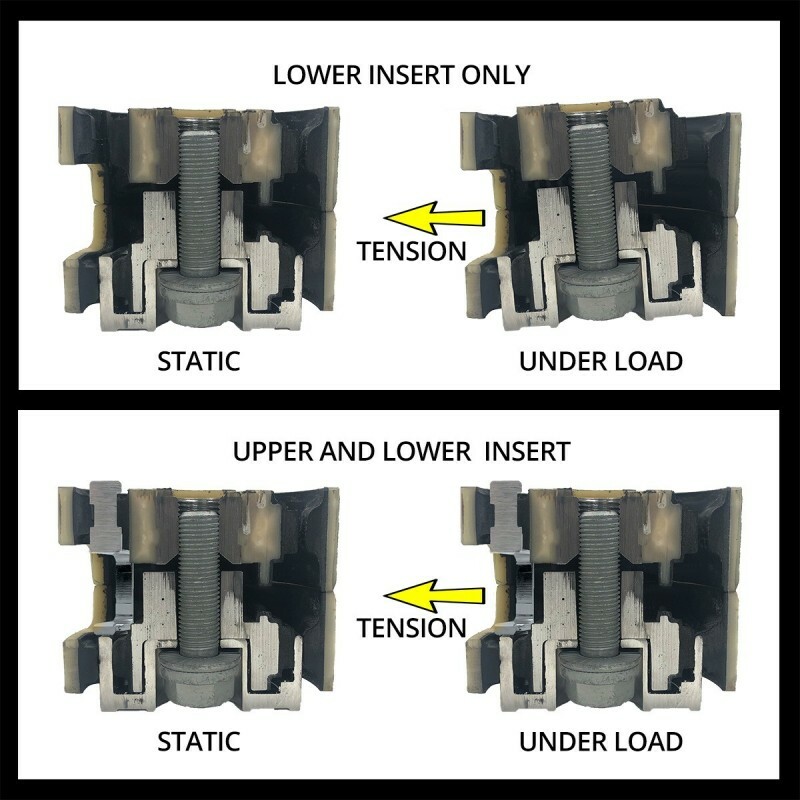 Our testing has shown that regardless of arm design and the material used, the arm cannot be made strong enough to withstand this bending moment. We tested arms manufactured using 6061 aluminum, 7075 aluminum, and stainless steel. The results were all very similar. The dogbone mount arm showed signs of bending with just two burn-out induced wheel-hop events. Complete failure of the dogbone arm occurred in as few as four wheel-hop events. We have high confidence that other brands spherical dogbone mounts will have similar failures. 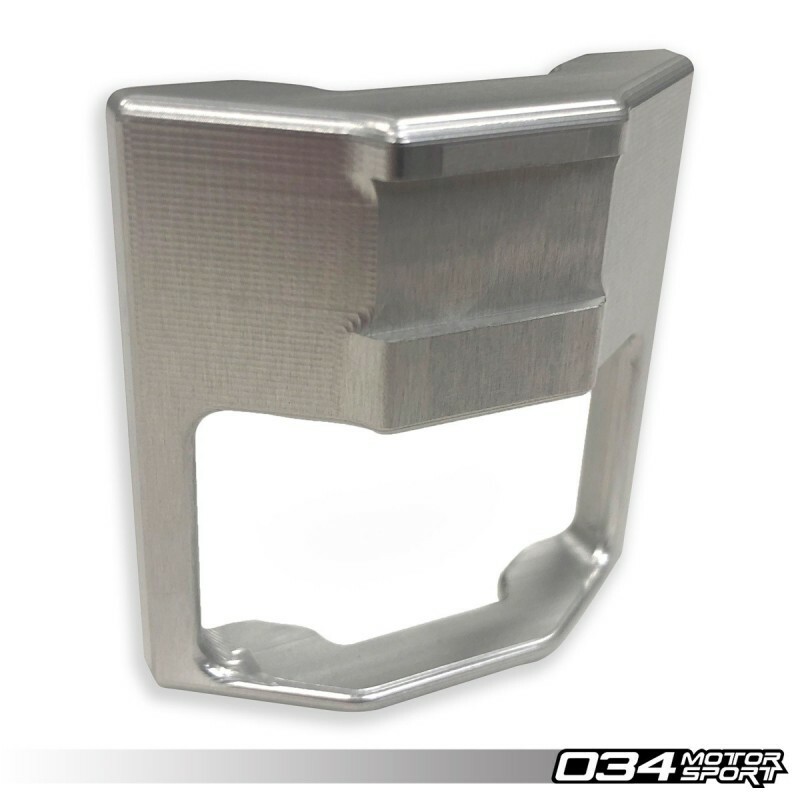 This testing revealed the cause of the bending, and our engineering team developed the 034Motorsport Billet Upper Dogbone Mount Insert to solve the issue. 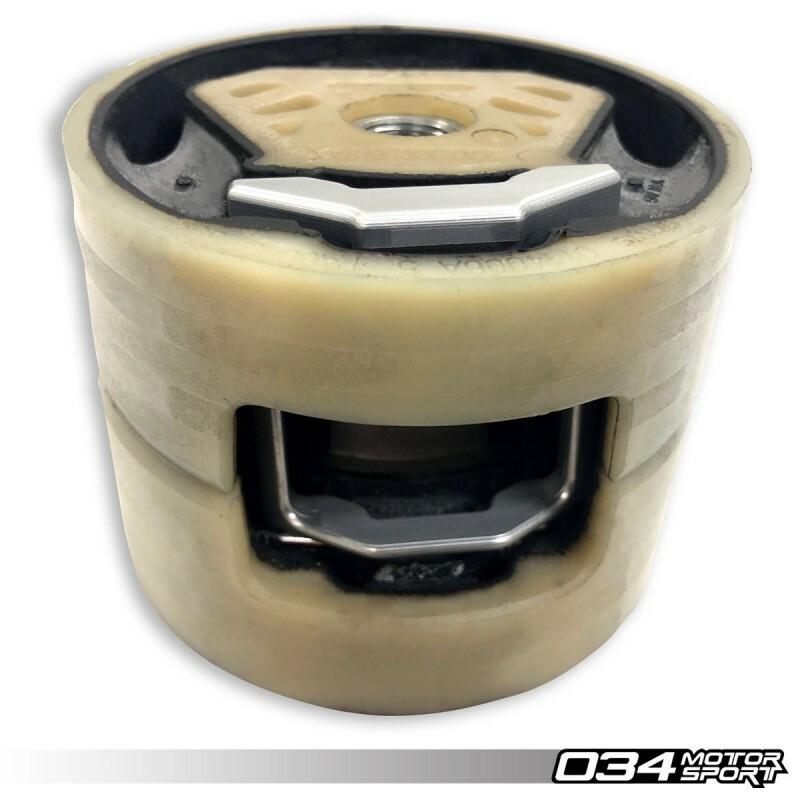 This insert slips into the front void of the upper dogbone mount puck, limiting the forward motion of the upper puck to match the limited forward motion of the lower puck with the lower insert installed. The result is an upper and lower insert package that eliminates the rotation inside the puck assembly during extreme drivetrain shocks, and keeps the forces acting on the dogbone arm in the direction the arm was designed for. Subsequent testing showed no signs of bending or stress in the dogbone mount arm with both the upper and lower dogbone mount inserts installed. Watch the demonstration video below to see how the dogbone mount pucks move with just the lower insert, and the upper and lower insert combined.